Virginia (Ginny) Rose Strosser, age 87, of Lancaster, died peacefully at the home of her son and daughter in law after a full and rewarding life. Her family was by her side. She died of a stroke and the resulting complications. She was born in Herndon, PA, to the late Casimir and Helen (Gappa) Brezgel. 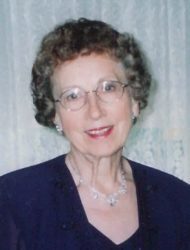 Virginia was a graduate of St. Joseph’s Hospital School of Nursing, obtaining her degree as a registered nurse in 1952. She met Emil Edward Strosser, III, while roller skating at Rocky Springs roller rink and they married on June 20, 1953. In addition to being a nurse, she was certified as a massage therapist and worked independently in that capacity for 15 years. Virginia and the late Emil had 9 children together and were married for 55 years. Both were well-known in the Cabbage Hill neighborhood where they lived. She was a lifelong, devoted member of St. Joseph’s Catholic Church. She enjoyed sewing, quilting, and dancing and was a member of The Tree of Life Quilters, Golden Hills and the Women’s Club at St. Joseph’s Church. Virginia became a resident of St. Anne’s Retirement Community in 2016. She is survived by her six daughters and three sons and their spouses: Veronica & Doug Meyers, Glen Burnie, MD; Frances & Ray Sherman, Virginia Beach, VA; Teri & Chris Ramsay, North Coventry, PA; Edward & Bonnie Strosser, Wysox, PA; Lisa Hilbert, Lancaster, PA; Bernard & Charlotte Strosser, Lancaster, PA; Timothy Strosser, Lititz, PA; Patricia & Ed Garner, Lancaster, PA; and Virginia & Paul Townend, Wilmington, NC. Also surviving are 27 grandchildren and 17 great grandchildren and 1 sister, Leona Simko, Elysburg, PA. She is preceded in death by her siblings: Irene Faeth and Casimir Brezgel. Relatives and friends are respectfully invited to attend the Mass of Christian Burial Friday, April 12, 2019 at 11 AM at St. Joseph Catholic Church, 440 St. Joseph St., Lancaster, PA. Interment will be in St. Joseph New Catholic Cemetery. A viewing will be held at Charles F. Snyder Jr. Funeral Home and Chapel Inc., 3110 Lititz Pike, Lititz, PA Thursday evening from 6 until 8 PM. The rosary will be recited at 7:45 PM on Thursday at the funeral home. A second viewing will be held at the church Friday from 10A.M. – 11A.M. In lieu of flowers please donate to St. Anne’s Benevolent Fund, 3952 Columbia Ave., Columbia, PA 17512. Please accept my condolences and know you are all in my thoughts and prayers. Please accept our deepest condolences. Our thoughts and prayers are with you, even though we are physically unable to be there with you today. There are only great memories of the good times and talks we had and the kind and loving person your Mother was. Terri and all siblings, I want to extend my heartfelt sympathy to you all and hope God heals the pain of loss. Your Mom was a quiet, gentle woman. Our families were alot alike in that there was a lot of us and we all have a matriarch who will be missed greatly. I wanted to get to the Rosary or funeral, but I wasn’t able, sorry. Please know I and my entire family will be thinking of your family during this difficult time. God Bless! Ronnie, Frannie, Teri and all of the Strosser siblings – reading your mother’s obituary was as if I was reading my own mother’s obituary. What a sweet mother she was. I have very fond memories of spending time with you all on Fremont street, particularly in the summer. Oh those sour cherry trees! God bless all of you. Please accept our sincere sympathy on your mother’s passing. Praying for your peace. Our memories are all happy and joyous remembering this wonderful woman. Our sincere sympathy to the entire family. To the entire Strosser family, I am very sorry for your loss. Your mother was a very special woman, having raised such an awesome family! I have fond memories of her, growing up on Fremont St. May your mother rest in peace.